The 4K UHD Blu-ray disc of Warrior is beautifully presented in 2160p high definition video quality and accentuates the sharp differences between Tommy’s and Brendan’s worlds. Over the years there have been numerous films that include the sport of boxing as a backdrop and even a few that include wrestling but until 2011's Warrior there has never been a movie that showcases the sport of Mixed Martial Arts (MMA) fighting. Just like Rocky or Million Dollar Baby, the action itself isn't the focal point of the film but serves as a useful tool to create tension for the drama surrounding it. The plot has a basic premise that could include almost any sport or even none at all, but the violence that is encompassed in MMA fighting helps shape and mold the characters and the audience perception of them. Tommy Conlon (Tom Hardy; Mad Max: Fury Road) is a military soldier and the younger of two sons of a former boxer/ alcoholic/ abusive parent, Paddy (Nick Nolte; Cape Fear). He is angry at the world and ready to fight anyone who looks at him the wrong way. He is also a hurt little boy on the inside and emotionally closed off. He becomes an internet sensation when a viral video shows him taking down Mad Dog (Erik Apple), one of the top MMA fighters in the Country, which inspires him to ask Paddy to help him to train for the Sparta Contest, a "winner takes all" MMA competition. Brendan Conlon (Joel Edgerton; The Gift) is Tommy's older brother who is a high school Physics teacher and former MMA fighter. In an effort to keep from losing his house, he starts fighting again and when his trainer's best guy gets injured, Brendan begs to be sent to the Sparta competition in his place. The obvious underdog, Brendan must use his intellect to outsmart his competition and win the $5 million prize money. Ultimately, Brendan surprises everyone and makes it to the finals only to be face to face with his estranged brother, Tommy. Director Gavin O'Connor (Miracle) really knows how to cast his films in order to get maximum use out of his performers. All three leading men were perfect for their roles and Jennifer Morrison (Once Upon a Time) as Brendan's Wife, Tess, is well cast too. Nolte plays Paddy as a fractured man trying to make amends but who also understands he doesn't deserve the forgiveness he seeks. His obvious hurt though is no less compelling. Edgerton is the perfect combination of softness and hard as nails drive and determination and Hardy simply does what Hardy does best – the brooding, angry, Neanderthal-like male who doesn't need anything nor anyone. The 4K UHD Blu-ray disc is beautifully presented in 2160p high definition video quality and accentuates the sharp differences between Tommy's and Brendan's worlds. It is evident even in their training facilities, where Tommy's is dirty and gritty and he is surrounded by tough, mean, guys who always eye him suspiciously and Brendan's is clean and tidy and where everyone is encouraging and pushes each other to be their very best. The Dolby Atmos audio is clear and crisp with the dialogue sitting nicely in the center channel and background noises (like the crowd cheering) filling the surrounding speakers. The Warrior combo pack has a number of extras including: Digital Download, Audio commentary with Gavin O'Connor, Anthony Tambakis, John Gilroy and Joel Edgerton, Redemption: Bringing Warrior to Life, Philosophy in Combat: Mixed Martial Arts Strategy; Simply Believe: A Tribute to Charles "Mask" Lewis, Jr., "Cheap Shots" Gag Reel, Brother vs. Brother: Anatomy of the Fight, and The Diner Deleted Scene. While many of these extras offer terrific insight into the world of MMA fighting and give the viewer a sense of the friendship that developed between the cast and crew, others, like the Anatomy of the Fight were not as interesting or informative. I started out hating this film finding the pacing slow and the characters somewhat uninteresting. However, partway through the film when they end up at the Sparta Competition in Atlantic City, I became more invested in these men, their relationship with each other and their father and their need to thrive in this arena. So if you can sit through the first half of the film and stomach the fight scenes at the end (which I had a hard time doing) the payoff is watching a beautifully acted, well put together film with heart and soul. Download Warrior from the iTunes Store in Digial HD. 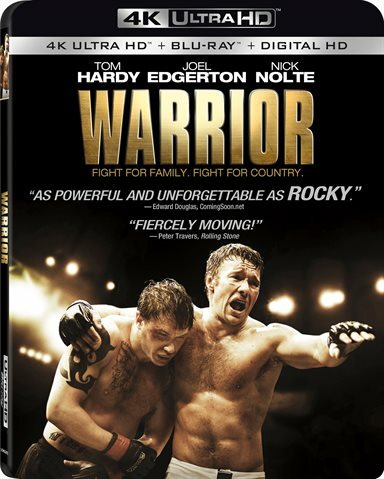 For more information about Warrior visit the FlickDirect Movie Database.